Pixar returns to form with a visually impressive, touching, and heartfelt story that will win audiences over across the globe. Illuminates the Mexican culture and educates about their traditions in a respectful, thoughtful, and important way. Oftentimes, Pixar doubles down on themes of family, love, and acceptance. Coco addresses these themes within a fantastical setting where the living and the dead come together as one. The film focuses on Dia de los Muertos, the Mexican celebration also known as Day of the Dead. With skeletons as major characters, Coco might confuse younger, inquisitive viewers who may not grasp or understand the concept of death. And then, Mom and Dad, they may ask questions. Detractors point to Guillermo del Toro's Book of Life and believe this to be an unoriginal, knock-off to that 2014 animated film. Though predominantly being stated among Caucasian film critics and writers, the cultural appropriation tag has been tossed around when describing Coco in a negative manner. After a run of good, acceptable, and somewhat underwhelming fare like Monsters University, The Good Dinosaur, and serviceable sequels Finding Dory and Cars 3, my excitement had mellowed a bit for the Pixar brand. However, with Coco, they have apparently snatched my heart right out of my chest and instantly won me back. Telling the story of 12-year-old Miguel (Anthony Gonzalez), whose family has banned all forms of music for decades, Coco takes a few different walkabouts in the time it spends with viewers. Initially, this is a film about stubborn determination and the pitfalls which can come with short-sighted decisions. Then, it becomes a fantastical adventure about righting wrongs, understanding the value in pausing to listen and learn from one's family, culture, and exploring the ways we grow and benefit from moments and experiences we often take for granted. Then, ultimately, Coco is a story about emotional redemption and healing, addressing how richly we benefit from the stories and memories generated by those who share in our respective heritage and lineage. With music forbidden, Miguel has an understandable love and obsession with creating it. That passion to make music is on the verge of crashing into a family history he has no knowledge about. He is obsessed with the late Mexican singer and movie star, Ernesto de la Cruz (Benjamin Bratt), born in his same small community, who became a global icon decades before Miguel was born. His ballad, "Remember Me," is one of the most cherished songs of all time, and Miguel has secretly studied videotapes of the singer, teaching himself to play guitar just like his idol. We learn all of this as Miguel's family prepares for Dia de los Muertos, the annual Mexican tradition of honoring the dead. Through the pictures and heirlooms shared on the family's ofrenda, we learn that a ban on music came from Miguel's great-great grandfather abandoning his wife and young daughter to pursue music. He never returned, leaving a sour set of feelings with Miguel's great grandmother Coco, passed down from generation to generation. Miguel pushes back hard against his family, when his love of the guitar is discovered. The breaking point, for all involved, comes during a Dia de los Muertos community talent show. Miguel wants to play, the family says no, and a curse of sorts in unleashed, propelling Miguel into a fantastical world known as "The Land of the Dead." 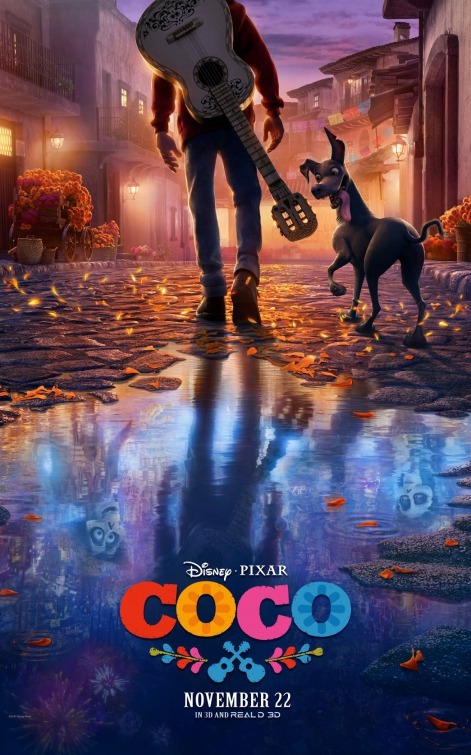 Coco is stunning from a visual standpoint, the meticulous color palette and strict attention-to-detail providing something of a transformative landscape for director Lee Unkrich (Toy Story 3), and co-director Adrian Molina, to carry viewers through the legacy and history of this storied cultural tradition. For Miguel, the instrument symbolic of his family's hatred of music, the guitar, serves as a passport into a world where he finds he can communicate with the skeletal incarnations of his family. The cast deliver impressively, with the young Gonzalez confident and impressive in his work, appearing in nearly every scene. Gael Garcia Bernal's work as Hector, a guide and companion for Miguel through the Land of the Dead, is genuine and moving. Within Miguel's family, each character has depth and a distinctive voice, and whether it is with the now-frail Coco (Ana Ofelia Murguia), the matriarch of the family, Abuelita Elena (Renée Victor), or Bratt's bombastic, larger-than-life de la Cruz, Coco gives us voices and visuals and music that leap off the screen and stay with us long after the credits fade to black. Also, it would be irresponsible to not recognize the score from Oscar-winner Michael Giacchino and the work of Oscar and Tony-winning composers Robert Lopez and Kristen Anderson-Lopez, whose centerpiece song, "Remember Me," is well on its way to an Oscar nomination for Best Original Song. While Coco is not a new story per se, the Guillermo del Toro-produced Book of Life told a similar story in 2014, the film does introduce, to American audiences, a new way of celebrating and remembering those who have passed in our lives. As someone personally who has always struggled with the acceptance of the finalities of death, Coco is a movie that has the potential to enlighten, soothe, and inform those who are in a similar place. Here, moments matter. Though cultural differences may exist, we all are interconnected by an inherently human set of emotions. Love, understanding, acceptance - these themes prove universal and Coco offers a much-needed statement of unity and inclusiveness. 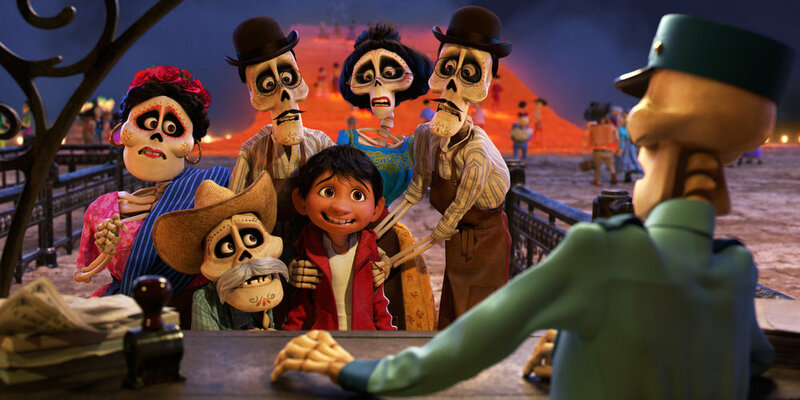 With so much to celebrate here, Coco does labor a bit with a subplot that tries to resolve the mystery behind what has fueled Miguel's family's agitations. There will be no spoilers here, but I think it would be fair to say that in a movie that celebrates life and death with such respect and dignity, this particular element to the story strikes something of a wrong note. Be that as it may, Coco finds its voice once again, building to a tremendous final act that delivers an emotional wallop and a further understanding of unconditional love and how basic misunderstandings can grow into monsters seemingly impossible to defeat. Time will tell whether Coco reaches the rarified air of Pixar's classics like the Toy Story trilogy, Up, The Incredibles, WALL-E, and so many others. For now, this serves as a breath of fresh air. Coco centers and informs us. Potentially, it can humble us and set things right. Through allowing us to see things in a different way, we have a chance to walk out of the theater stronger than when we walked in. Featuring the Voices of: Anthony Gonzalez, Gael García Bernal, Benjamin Bratt, Renée Victor, Ana Ofelia Murguia, Alanna Ulbach, Jaime Camill, Sofia Espinosa, Edward James Olmos, Selene Luna, Alfonso Arau, Luis Valdez, Cheech Marin.